Head designer Alex Wang worked on the Mayson philosophy for years before our production line came to life. He re-invented the acoustic guitar, combining the soul of old fashioned luthier skills with the accuracy and consistency of modern hi-tech machinery. Alex’ designing ideas form the heart of the distinguished Mayson character. The neck-body joint is a special, much stronger design than conventional joints. 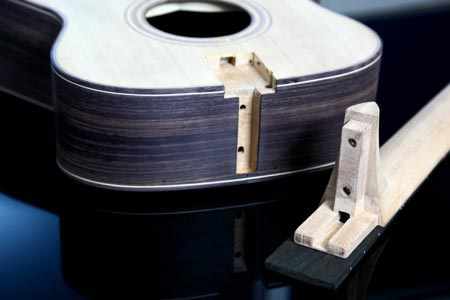 It allows better resonance of the top as well as a more stabile fingerboard. 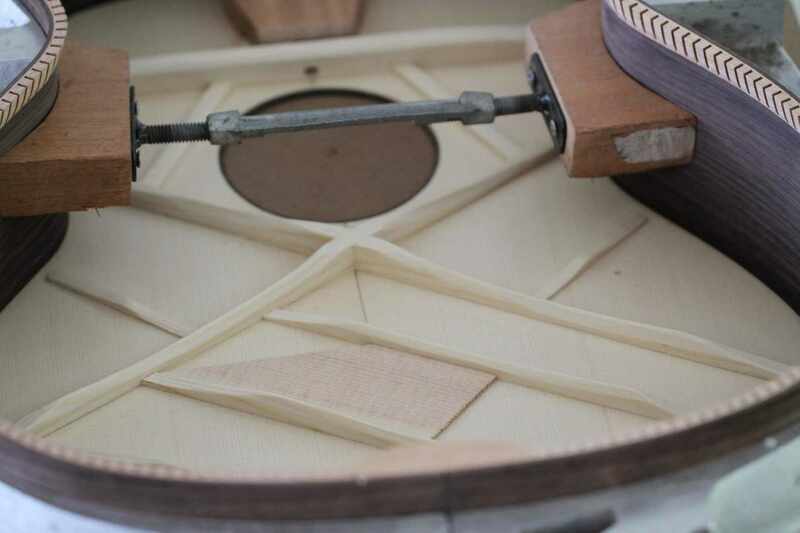 The trussrod construction assures that it's tension works there where it is needed: in the neck, not affecting the top board. 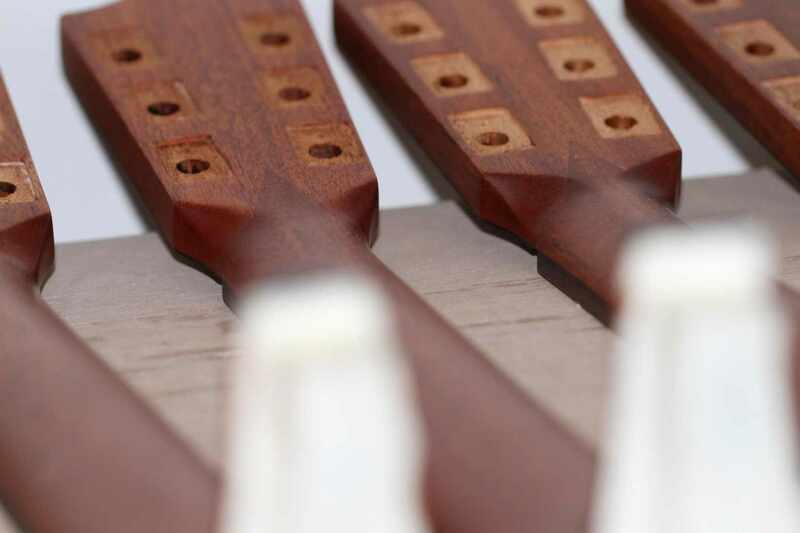 The headstock is computer-cut from the same piece of African mahogany used to make the neck. The V-shape cut maximises the glue surface adding strength to this fragile part of the guitar. It also secures the mounting angle and direction for an evenly spread string tension of more than 80kg. 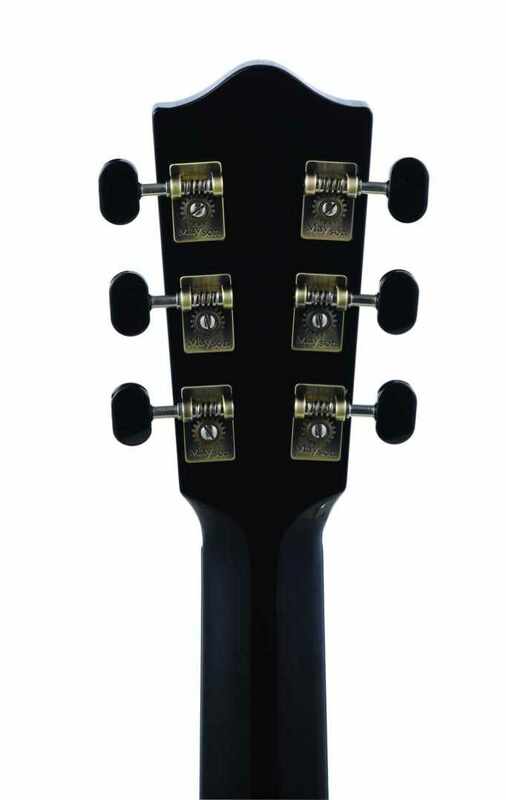 The machine head ground plates are embedded in the headstock, eliminating possibility of sideways rotation as result of string tension. Other designs include fixation by a screw, weakening the strength of the headstock. The traditional X-bracing was dropped in favour of a custom longitudinal design for improved reverberation. Using very tight margins while selecting the top wood allow us to minimize mass in the bracing patterns, preventing 'overbraced' and thus too stiff tops. The kerfed lining used for mounting back, sides and top are computer cut following our special design. Shape, kerf size and spacing are dynamic, adapted to the mounting position in the guitar for a perfect balance between flexibility and strength. The top is mounted with granular material braces, conducting the sound more easily to the sides, enhancing the top's elasticity and vibration. Lastly, we make thicker bodies for a richer sound and better low frequency response.